After we had finished up at the beach we decided to take an early dinner at the Chart Room Restaurant down the road. 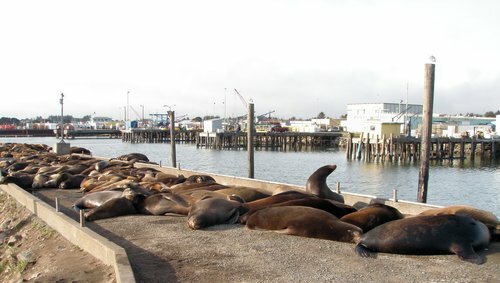 As we pulled into the parking lot I saw sea lions and seals lounging on a peer soaking up the sun. We got out of the car and were greeted with the most unpleasant smell from the seals and sea lions which I can only assume puts a damper on the restaurant’s outside seating in the summer. As we approached the restaurant we got an up close view of the seal lions and seals. I had never been so close to these massive animals before, however I was pretty sure I could out run them if necessary. taking a nap in the sun! I took photos of them, watching them wiggle around, taking in a quick swim or two and basking in the sun. There were a few sea lions laying near the sidewalk that I was standing on, but little did I know that I would become closer to one shortly. 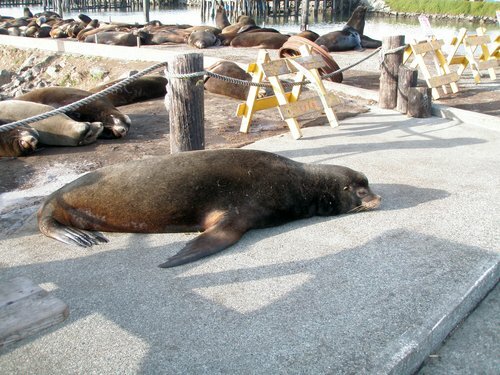 A rather pushy sea lion had come in from his afternoon swim and decided to lay down in his spot. Unfortunately his spot was already occupied, however this did not stop him from laying down on top of his so-called buddy. I imagined the conversation went like this “I lay here now”. The other sea lion of course would say with the air squished out of him “oh, OK”. 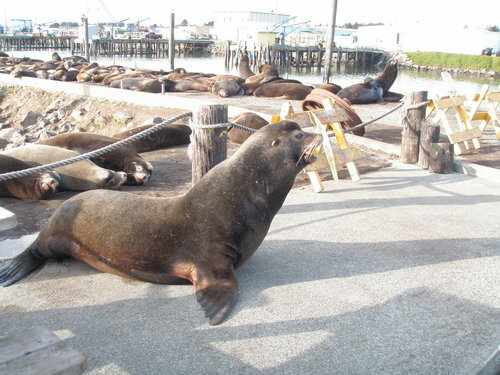 The dejected sea lion did what only he could do and move out of the way. He walked out onto the sidewalk where we were standing, slightly bitched a bit and flopped back down, but who could blame him he had just been sat on. Poor little guy. 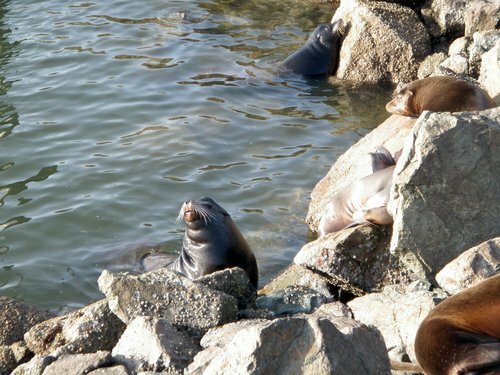 We stepped in the restaurant and grabbed ourselves a quick dinner of seafood inspired cuisine and continued to watch the seals and sea lions from inside. It was much more pleasant from the inside as we were no longer subjected to the smells of the marine life! After dinner we made a stop at Battery Lighthouse. We were unable to take a tour of the functioning lighthouse as we had arrived too late but we were able to walk the grounds. 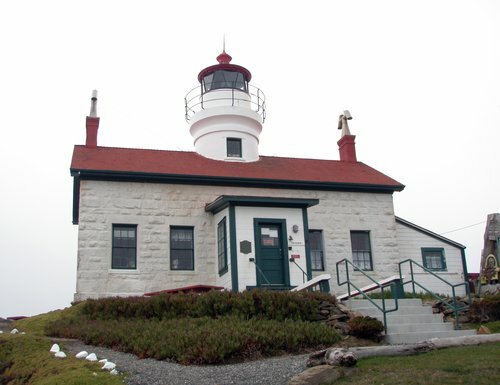 The lighthouse was built in 1855 and became fully functional December 10th, 1856. Battery seemed like a strange name for a lighthouse but in further reading I found that a ship in 1855 had burned in the harbor and the canons were saved and placed on the point. The point earned the name battery point, which led to the name of the lighthouse as it was placed on the point. Low hanging clouds and fog had rolled in reducing our visibility of the ocean. 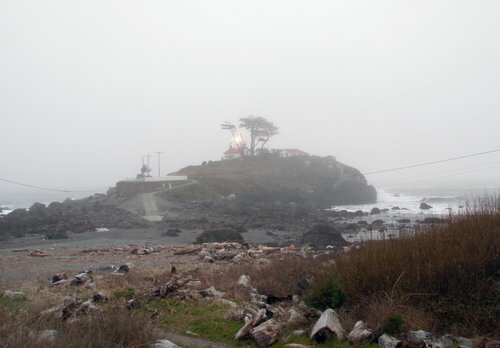 The lighthouse’s light was operating and I even caught a glimpse of the light keeper. 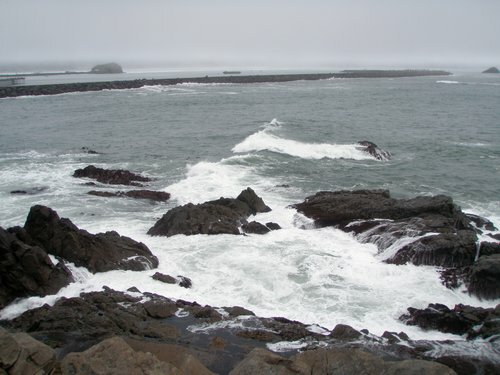 We walked around the grounds taking in the sights of the ocean that we could see while the waves crashed against the bluff the lighthouse sat upon. If you would like to visit Battery Lighthouse it is located at 577 H St. Also remember you can only get to the lighthouse during low tide. They are open daily April – September. Dogs are not allowed on the property. 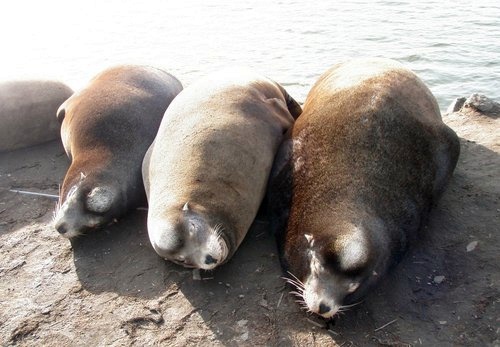 Tagged Crescent City California, lighthouses, marine life, sea lions, seals. Bookmark the permalink.